Here are 10 (based on number of followers) Restaurants & Cafes that do their social media in style. We've also provided a brief summary of our take on what they do that's different - beyond typical 'special offers' on Valentines Day. Want to know more about local businesses rocking social media in your own neighborhood ? The Free EyesAndFeet application has the details. PS: We haven't included the big chains (Like McDonalds, Starbucks...) in this list - it just wouldn't be fair - or interesting for that matter. So there you have it: all independent establishments! Want to decide on a new addition to your Menu? Just ask your followers on twitter like this Miami bakery does with its tweets. The Yellow Submarine burger & hotdog place always supports their home team with questions and posts relating to the games. Quirky tweets are always more interesting to read, and also they are more likely to be clicked on, as intriguing tweets like: "What is the Truffled Toad in the Hole" illustrate. Yummy recipes straight from your kitchen is a nice way to engage with hungry people. The Latin Grill House picks up several of their speciality dishes and posts them on twitter. You don't need to wait for Memorial day or Games night to wish your customers on twitter. A Friday wish with an invitation to Sushi & Cold Sake can be a potent combination. 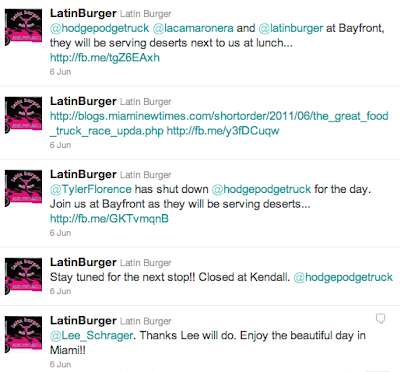 Being part of interesting events like the Great Food Truck Race is always an advantage - for businesses to tweet about. Needless to say, this also keeps followers' interest high. 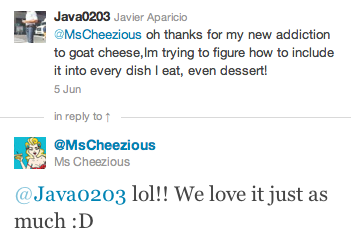 Polite and speedy replies to their customers' tweets make this Miami Cheese Comfort food truck a hit on twitter. They mean business in most of their tweets with mention of their phone number and web address. And hey, it seems to work! In twitter SIZE does matter and this Latin Burger joint knows just that with interesting tweets and treats at regular intervals throughout the day. Its almost like they have a machine working for their twitter id churning those tweets as fast as their fast food burgers. This, and presumably great burgers - makes them Miami's Numero Uno Tweeting champion.